US Marine Corps defence counsel Major Michael Mori said the ruling meant he was "another step closer to getting David Hicks out of there". Mr Hicks's Adelaide-based lawyer, Stephen Kenny, says despite the Supreme Court ruling, it could be three years before his client's legal challenge to detention can be heard. Mr Kenny says the decision challenges the Australian Government's belief that Hicks is being treated fairly. "If the Attorney-General insists on maintaining his line that it's a fair system, I again challenge him to bring out his legal advice that says it's a fair system," he said. "If he can't then he needs to insist on bringing David home and if David's done anything wrong to prosecute him in Australia in a fair system." Joe Marguilies, who represented the two Australians before the Supreme Court, says he is concerned about the other Australian Mamdouh Habib. "I want to see him right away, and I want assurances about his welfare as soon as possible," he said. Lawyers are expected to seek access Mr Habib and over sixty other detainess, [prisoners], within the next week. Maj Mori has said in the past that his client has been denied "fundamental" privileges given to civilians or soldiers facing court-martial. In a letter, Mr Hicks's father Terry called Monday's ruling "a great day for justice, one we did not think could be obtained". Mr Hicks, who comes from Adelaide, is one of two Australians being held at Guantanamo, along with Sydney man Mamdouh Habib. The US Supreme Court ruled in a 6-3 decision on Monday that the "United States' courts have jurisdiction to consider challenges to the legality of the decision of foreign nationals captured abroad in connection with hostilities, [? scapegoats], and incarcerated at Guantanamo Bay". 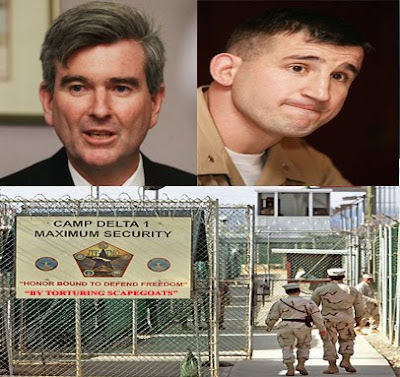 The case, involving about 600 detainees, [prisoners], from 42 countries at Guantanamo, was one of two landmark decisions handed down by the court in the controversy over tactics, [rendition and torture], used by US authorities, [war criminals], since launching the 'war on terror', [the Coalition of the Killing's resource war's in the Middle East], after the, [USA, CIA, reichstag, call to arms, false flag], September 11 attacks in 2001. The United States government has charged Mr Hicks with conspiracy to commit war crimes, attempted murder and aiding the enemy. Virtually all the other detainees, [prisoners], have been held without charge and access to court. According to the Centre for Constitutional Rights (CCR), a New York-based interest group which has taken up the case of Guantanamo detainees, [prisoners], Mr Hicks has spent several months of his confinement in 'solitary confinement',[tortured], awaiting charges.